'Why does the church stir up such negative feelings?' This is a question that Philip Yancey has been asking all his life - for himself, as a pilgrim; for others, as a journalist. The question is more relevant now than ever: in the UK Christianity continues to decline, even as it is increasingly thought to be linked with intolerant, fundamentalist attitudes. Yancey's lifelong writing career has always focused on the search for honest faith that makes a visible difference for a world in pain. In his landmark book What's So Amazing about Grace? he issued a benchmark call for Christians to be as grace-filled in their behaviour as they are in asserting their beliefs. People inside and outside the church are still thirsty for grace, Yancey points out. Perhaps what the church seemed to lack in its heyday is now, in its increasingly marginalised stance, exactly what it needs to recover in order to thrive. Grace can bridge the gap across the movement away from Christianity, inviting outsiders as well as insiders the chance to take a deep second look at why it matters and what could reignite its appeal to future generations. How can Christians offer grace in a way that is compelling to a jaded society? And how can they make a difference in a world of such wrenching need? 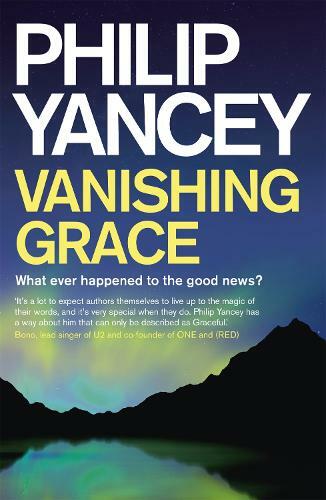 Vanishing Grace: What Ever Happened to the Good News is a milestone book for all those who are striving to make sense of their faith and live it out amid the changing landscape of our day. Philip explores how Christians may have contributed to hostility toward them by presenting the gospel in ways that come across as strident and judgemental. Then he explores what kind of news is good to a culture that thinks it has rejected the Christian version. And finally, he offers illuminating stories of how faith can be expressed in ways that disarm even the most cynical critics - through pilgrims, activists, and artists rather than through preachers, evangelists, and apologists.